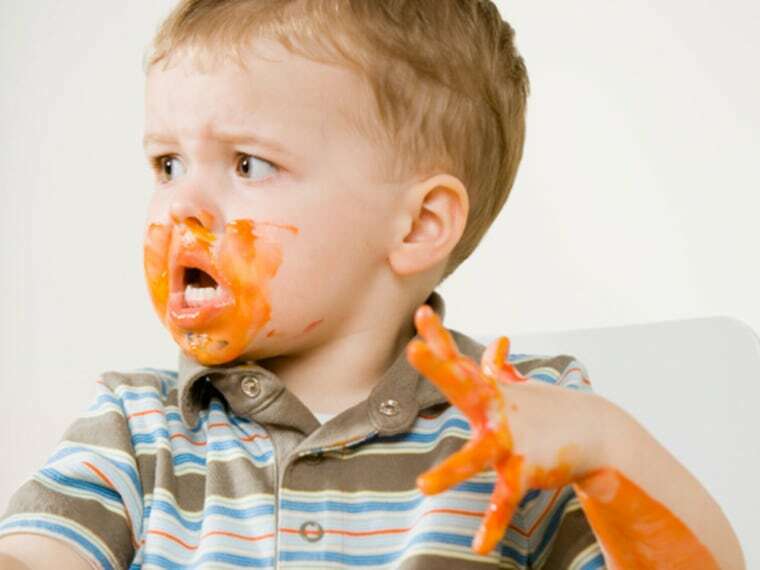 Next time your baby mashes his bananas, apple sauce AND carrots all together — not to mention all over his hands, hair and the high chair—don’t fret about the mess. Your little one just may be getting smarter in the process. In a study of more than 70 kids, aged 16 months, researchers at the University of Iowa wanted to know how well children learn words for non-solid objects, such as mushy oatmeal and gooey glue. Previous research has shown that toddlers learn more about solid objects because they can easily identify them due to the unchanging size and shape of the objects. But it turns out that if you put toddlers in a setting they are familiar with, such as sitting in a high chair stuffing their mouths and playing with food, they actually do better at learning the names of foods in differing shapes and sizes. So says a paper published Monday in Developmental Science by University of Iowa researchers Larissa Samuleson, Lynn Perry, and Johanna Burdinie. In their study, the researchers exposed 16-month-olds to 14 non-solid objects, foods such as applesauce, pudding, soup and juice. After one minute, they asked the kids to identify the same food in different sizes and shapes. This required the kids to go beyond relying simply on shape and size and to explore what the substances were made of to help identify them correctly. Share your photos of messy eaters on our Facebook page! In the study, the kids who did the most poking, prodding, touching and tasting were more likely to correctly identify the foods. But where the kids sat also played a role in how likely they were to do so. Samuelson, associate professor of psychology at the University of Iowa, says her prior work had suggested that children did not learn names for non-solid things like pudding and Jell-O as easily as they learned names for solid things like cups and cars. “But I knew (children) had a lot of experience with non-solid things because many of the things we eat are non-solids. I also knew that the context of prior experiences matter for your memory of them. So we decided to try the highchair,” Samuelson said. When the children were in a high chair, they were more apt to name the food than those children who were seated in other less familiar settings, such as a table, the study found. The researchers think that’s because kids generally know high chairs are a safe zone for getting their messy on. Perry says she was surprised by just how much something as simple as sitting in a different chair changed children’s behavior. The kids know that “the high chair is the place where they can play with and eat food, and they just dive right in and do that,” she said. Ultimately, all that eating and playing and making a mess taught the children something about new foods.